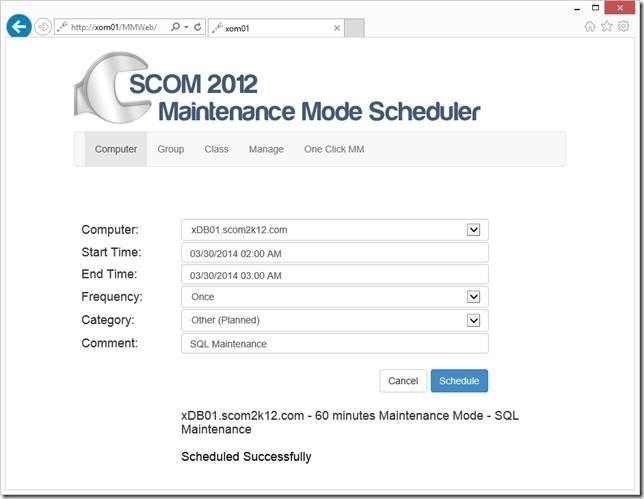 In this scenario a SQL Admin will be performing maintenance on a SQL server at 2:00am on Sunday. During maintenance, services might be stopped or the server might be rebooted. 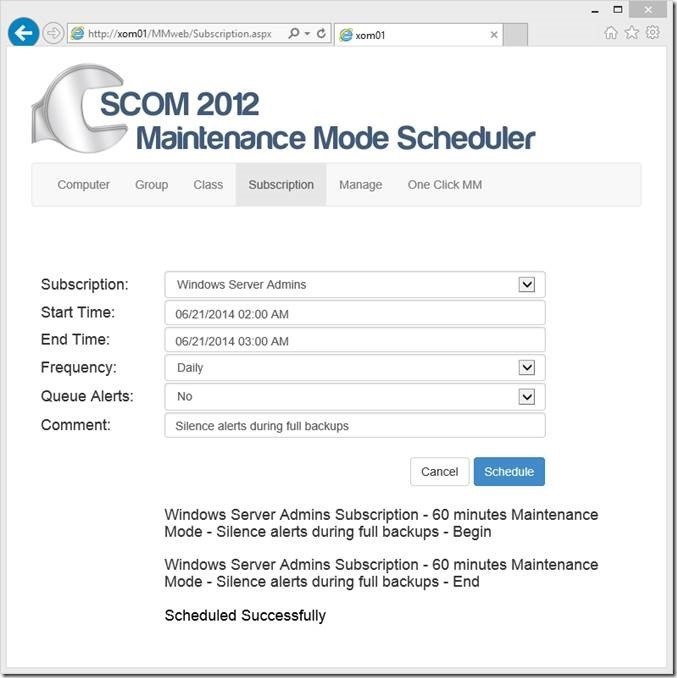 The admin opens Maintenance Mode Scheduler and schedules a maintenance window for this time frame so that alerts for the SQL server don’t get sent to himself or other IT support staff. 2.) 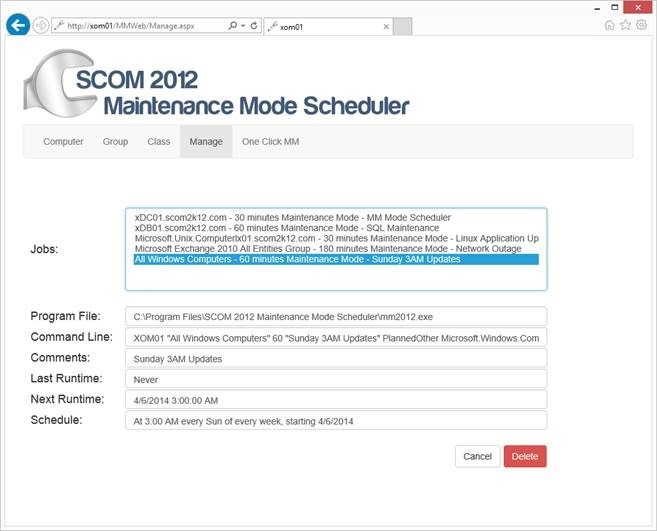 Pick the Computer to Schedule for Maintenance Mode. 3.) Under Start Time; Pick the time and date for Maintenance Mode on the computer to Start. 4.) 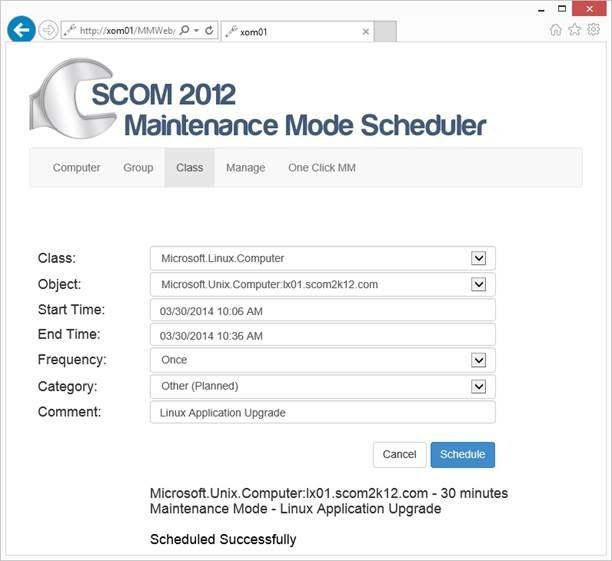 Under End Time; Pick the time and date for Maintenance Mode on the computer to finish. 5.) Under Frequency choose how often Maintenance Mode should run. a. Once – Run just once. b. Daily – Run every day at the Start Time selected. c. Weekly – Run every week on the day/time selected for Start Time. 6.) 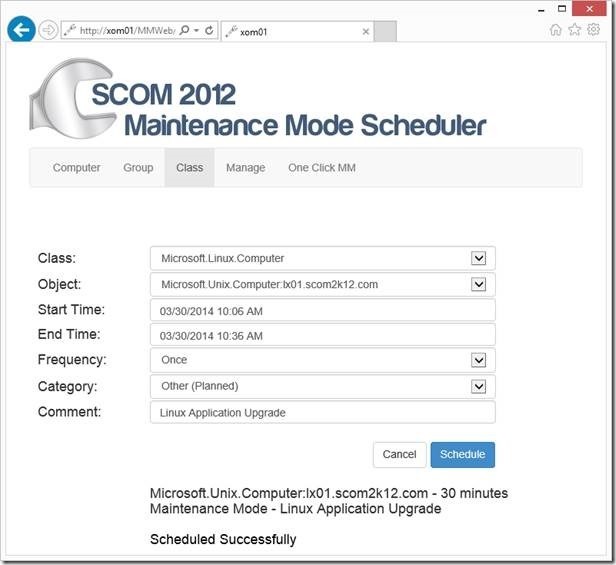 Under Category choose the category (Planned or Unplanned) to specify the maintenance mode. 7.) Under Comment: Type in an Optional Comment. 9.) Test by right clicking on the job and selecting Run. 11.) Right click on the server click Maintenance Mode and Select Stop Maintenance mode. 12.) Scheduled Maintenance Mode will now run at the specified time on the correct server. 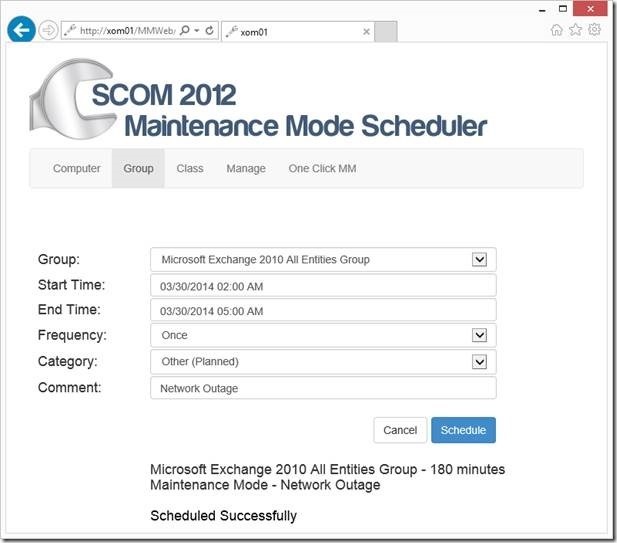 In this example, a Network Admin needs to perform maintenance on a network segment of Exchange Servers. The Maintenance will be performed on Sunday at 2:00am and the network will be down. 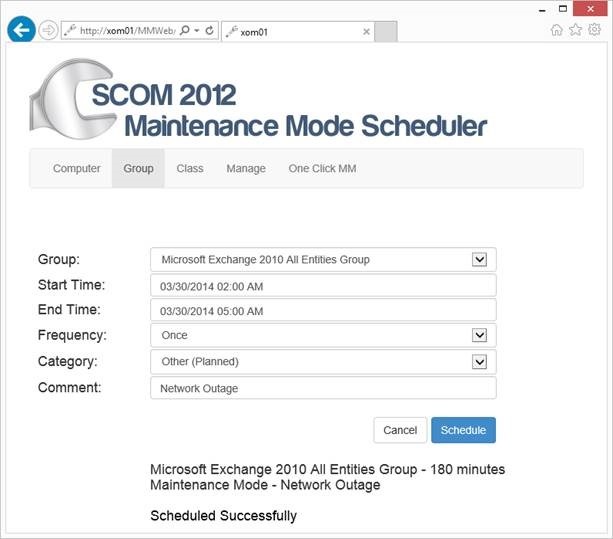 To do this, open the Maintenance Mode Scheduler and schedule a maintenance window for the Exchange Servers Group. With the maintenance window scheduled, alerts won’t be sent to the Exchange Admin or other IT support staff. 2.) Pick the Group to Schedule for Maintenance Mode. 3.) Under Start Time; Pick the time and date for Maintenance Mode on the group to Start. 4.) Under End Time; Pick the time and date for Maintenance Mode on the group to finish. Creating a shortcut on the desktop of the servers to make it even easier. Use System Center Configuration Manager, AD Group Policy or some other software deployment tool to deploy the shortcut out to all servers. 2.) The server is automatically put into maintenance mode for 60 minutes. In this setting a Unix/Linux Admin is performing maintenance on a Linux server on Saturday at 4:00AM. During the outage the server will be rebooted and the admin does not want to alert the NOC or the on-call engineer. 3.) Under Object: Pick the Linux Computer to Schedule for Maintenance Mode. 4.) Under Start Time; Pick the time and date for Maintenance Mode on the Linux computer to Start. 5.) Under End Time; Pick the time and date for Maintenance Mode on the Linux computer to finish. 6.) Under Frequency choose how often Maintenance Mode should run. 7.) 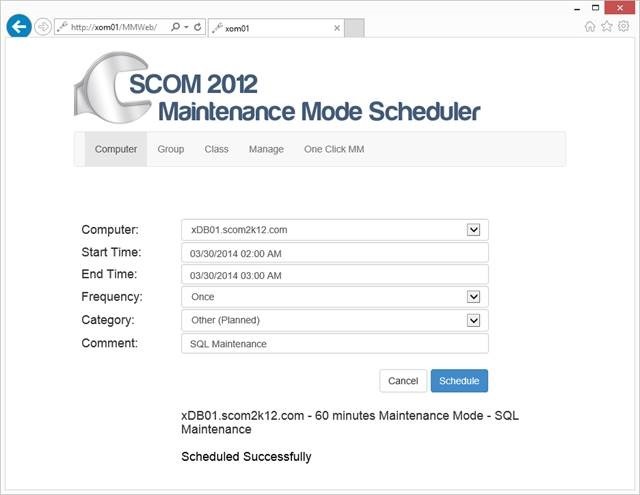 Under Category choose the category (Planned or Unplanned) to specify the maintenance mode. 8.) Under Comment: Type in an Optional Comment. In this scenario full backups are performed every night that create a flood of alerts for the Windows Team Pager. The team would like to not get alerted during this time. They have a complex subscription with individual monitors and rules for their alerts. Creating and maintaining individual groups for maintenance mode is too complex. They would like to just put the subscription into Maintenance Mode so they don’t get alerted in the middle of the night. **Note: The individual objects will still change state and create alerts that will not be sent to the subscription during the maintenance window. You can choose to send the alerts after the maintenance window or to discard the alerts using the Queue Alerts option. 2.) 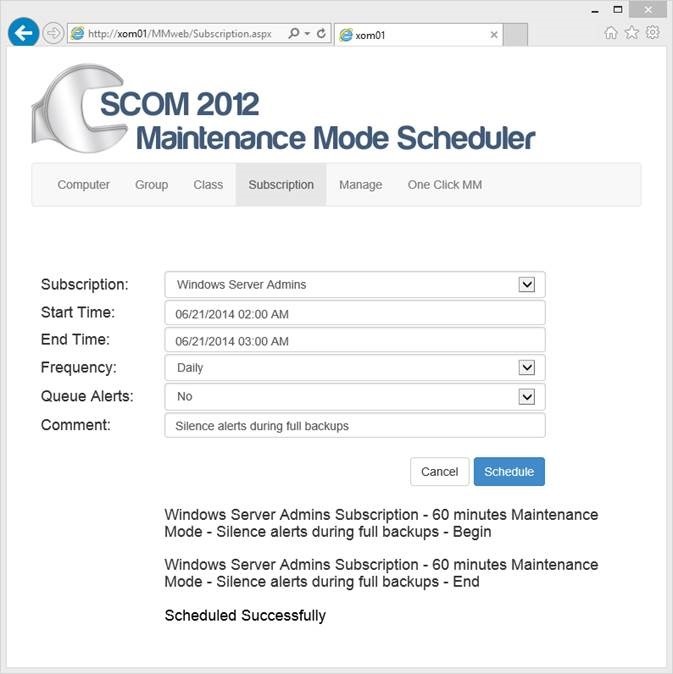 Pick the Subscription to Schedule for Maintenance Mode. 3.) Under Start Time; Pick the time and date for Maintenance Mode on the subscription to Start. 4.) Under End Time; Pick the time and date for Maintenance Mode on the subscription to finish. 8.) You may notice that when creating a subscription maintenance window it creates two jobs. This is normal as it creates a job to start the subscription maintenance windowsand one to stop the subscription maintenance window. 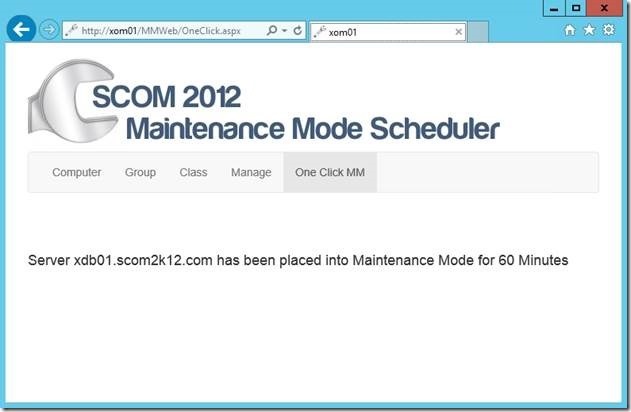 In this example an Admin has created a maintenance mode job that they no longer want to run. The job they want to delete is a re-occurring Sunday 3AM Maintenance Mode on all of their servers. 1.) 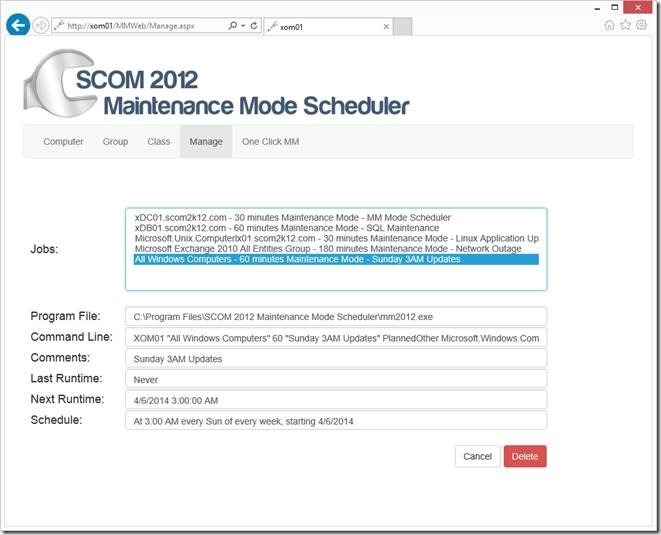 Open the Maintenance Mode Scheduler Website in Internet Explorer. 5.) For Subscriptions delete both the Begin and End jobs.